Cat lovers agree feeding becomes hell when a cat has sensitive digestion. If the food is wrong, the poor animal vomits. Thankfully, there is a solution for such sufferers. It is as easy as choosing a better brand of food for your cat. 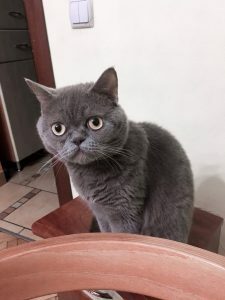 The following buyer’s guide reviews the key features you should pay attention to while choosing the ideal food for cats with sensitive stomachs. This way you are able to pick a product that benefits your pets and help them be healthy. Why would a Cat have a Sensitive Stomach? Allergy. One of the most common reasons for digestion problems with is a food allergy. There are a lot of allergic animals that also have a sensitive stomach – about 10-15 percent in the feline population. Intolerance. Some animals just cannot tolerate and digest certain nutrients. The classic example is lactose intolerance. 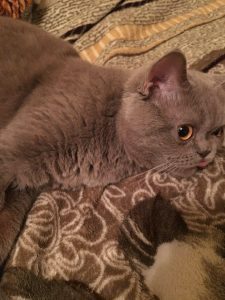 This condition is not an allergy, as an allergic animal is just hypersensitive to a product, whereas a cat with intolerance is not able to digest it at all. Products that exclude components that cause allergies or cannot be digested by a group of pets can cure the symptoms of a sensitive stomach. Diseases or parasitic invasion. There is a number of illnesses that cause symptoms such as indigestion and vomiting. To exclude this possibility, show your pet to a vet. Conditions such as parasitism can be treated quickly with the right medication. Accumulation of hairballs. Most household felines are serious about grooming. If the cat has long hair, it can accumulate in their small intestine. This is highly uncomfortable and may cause bowel inflammation and irritation. In case of uncontrollable vomiting, it is prudent to bring the cat to the vet to test for of hairballs. The overabundance of hairballs may happen due to overgrooming – and consultation with a specialist is in order. Feeding behavior. Rescue cats and cats suffering from a number of conditions can eat too quickly or even eat inedible objects such as paper or plastic. It usually happens to cats that stay indoors, as outdoor cats are hunters and mostly eat the meat they catch. Rapid change in diet. 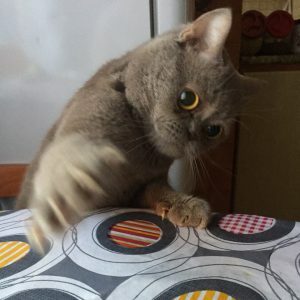 If you are trying to introduce a new food for your cat, do not do it quickly. If you suddenly replace the usual food with something completely different, your pet’s digestive system doesn’t have time to adjust. There are special, easily digestible products that can help with a transition in diet. As you can see, there are many causes for sensitive digestion. Therefore, the diet for your cat has to be adjusted based on its particular health condition. So, in choosing the proper feeding regime, understand the reason your pet has developed a sensitive stomach. 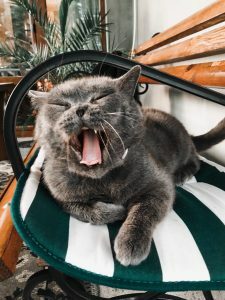 Cats suffering from a sensitive stomach can exhibit many distressing symptoms such as vomiting, retching, diarrhea, lack of appetite, and a dull coat. To remedy the suffering for your treasure with a tail – read food product labels carefully. Remember the best diet for sensitive animals depends on a number of key characteristics. The fewer, the better. It is better to choose food that has fewer ingredients. The life of an animal with digestion problems gets much happier with less assorted food. With simpler food, the risk of allergies or indigestion is much lower. Find Something New! As we have mentioned before, a sensitive stomach is often one of the symptoms of allergy. An allergy is usually a response to something your cat encounters regularly. Therefore, by suggesting new substitutions for a regular snack, you can decrease the allergy risk. Read everything! Be attentive to the list of contents displayed on packages. It is a great way to see if this particular food is easily digestible. Dairy and adult animals often do not mix. While kittens have proteins that help digest milk, adults either lose them, have lactose intolerance, or develop lactose sensitivity. So it is a good idea to avoid dairy products, including yogurt and cheese. Many producers include beef byproducts in animal food, making the production cheaper. Beef byproducts are a bad protein source and beef protein can also be an allergen. While choosing a brand, eliminate options that contain beef. It is much better to replace it with safer and more digestible protein sources such as turkey. You’ll decrease the risk of indigestion and allergy in your cat. The optimal feline diet has to be low on carbohydrates, high on protein, and contain a moderate amount of fat. Too much fat can cause pancreatitis – an inflammation of the pancreas which is crucial for digestion. When it fails, other organ systems can be affected as well. Acute pancreatitis is lethal. Some manufacturers add fat trimmings and end up with a high fat content. As you know, it isn’t good for your cat, and avoid such diets. Cats are strict or obligate carnivores. It means they feed predominantly on meat and do not really need carbohydrates in their diet. It also means not every feline is able to digest grain products. Allergies in cats are rarely caused by grains but because these animals are wired to eat predominantly meat, they can’t deal with carbohydrates effectively, including whole grains. The rule of thumb is to choose options without any carbohydrate – grains or starches. Such diets are a good option for diabetic pets as well. When you read content labels, you often come across various ingredients that are not nutrients. Those additives are preservatives, flavoring, fillers, vitamins, and minerals. They can complicate digestion tremendously. That is why the less ingredients and additives, the easier time your purring friend will have digesting it. Also the risk of vomiting or diarrhea is significantly lower. The seven products reviewed below represent the market’s best cat food for sensitive stomach. Each review is broken down into a similar structure to offer you an easy way to compare each examined item. Reviews begin with what each formula focuses on as well as company factoids. This is followed by a breakdown of features based on our table. Finally, the pros and cons are touched upon before our verdict for each product. This holistic brand offering is made to address feline sensitivity to dairy products or meal fillers. The Halo company began as a personal search to provide healthier diet options for the founder’s dog, Spot. If your pet requires a change of diet due to allergies or lactose intolerance could benefit from this dry food. The formula does not contain any dairy. Chicken instead of beef is used in this kibble. Chicken fat has been added here. Verdict: With limited preservatives, this formula might be perfect for your pet’s sensitive stomach. This kibble is heated for less time, allowing it to retain more of the natural nutrients found in its ingredients. Blue Buffalo works locally and online with many pet support groups. General Mills purchased the company in early 2018 for over 8-billion dollars. Coated to prevent digestive flare-ups, this product may offer felines relief from puking after they eat. Preserved chicken fat is added. A lot of grains are featured. Many additives are infused into this kibble. Verdict: Owners looking for an easy digestion cat food should find satisfaction with this selection. This product is formulated to be easily digestible in feline stomachs by using L.I.P. proteins that break down quickly. This company was founded by a French veterinarian in 1968, focusing on nutritional science. If your cat eats small portions due to health issues, this high energy selection could prove to be a good investment. This product does not use beef. Chicken fat is added to the mix. Corn and rice head a long list of grains. Lots of additives are present here. Verdict: Owners needing the most nutrients in small portions should be satisfied with this brand. Prebiotic fibers provide a gentle option in a sensitive digestive cat food. Purina began as an animal feed company in 1894 before merging with Nestle’s Friskies subsidiary in 2001. This formula caters to those needing an easily digestible food that won’t cost them too much money. No dairy should be found. This does not contain any whole meats. It uses preserved beef fats. Wheat is a big filler here. Mineral, preservatives, and vitamin are mixed in. Verdict: Those looking for an alternative that is affordable may want to look more closely at this product. This product focuses on offering a soft on the tummy food that breaks down easily. Hill’s Science Diet can trace its roots back to the 1930s when a vet determined that his four-legged patient suffered from poor dieting. Those with felines that do not suffer from lactose intolerance may find this easy on their pet. This does contain lactic acids. No whole meats are present here. Pork fat is used as an ingredient. Rice and oats make up bulk of kibble. Verdict: A reasonable choice for pets without lactose allergies. This product’s formula is designed to offer felines with an alternative that is less harsh during the breakdown process. Purina is known worldwide for its livestock and zoo feeds as well as for its domesticated pet foods. This flavor is targeted for finicky eaters who need help with digestion due to upset tummies. Main ingredient is lamb meat. Unidentified animal fast is added. Rice and oats are prevalent throughout. Additives included for consistency and taste. Verdict: Owners with picky pets may be interested in this flavor. This cat food easy on stomach linings with seafood taste. Halo prides itself on using natural sources and non-GMO ingredients. For those with a finicky eater who has a sensitive digestive system, this offering is designed to provide kibble that will not trigger problems. Small amounts of egg protein are featured. Salmon and whitefish provide most content. Preserved chicken fat has been added. It contains various grains such as barley. Preservatives can be found in the fat. Verdict: Owners looking for a kibble that will be easy on their four-legged friend’s tummy might contemplate this product. Determining what product matches your pet’s dietary needs is important for all owners. During our research, three questions continued to be asked by feline enthusiasts. The answers to these questions not only help in determining brands or flavors your kitty will eat, but it can also prevent them from developing even more serious eating problems. There are so many products available that you might feel overwhelmed, so the following questions are addressed to help you focus on healthy formulas. Most domestic felines begin to slow down once they are older than seven years. Aging in your pet is inevitable, but healthy nutrition can increase energy while slowing down some aspects of the aging process. Some nutrients become more vital as your pet ages. Foods containing anti-oxidants, fats, as well as minerals and vitamins can help. Fish and poultry should provide you with better food sources than beef or pork at this stage. Grains such as oats provide increased fiber that becomes more important to older pets. Older felines can often suffer from kidney issues, so proteins are usually reduced in their diets at this stage. Bad foods can cause similar symptoms, so watch your furry friend to prevent them from eating something that they shouldn’t. Other things that can cause vomiting or stomach issues might include overeating, eating too fast, or even sudden changes in foods offered. Finally, look for the best cat food to prevent vomiting in the first place. 3. Why does my cat throw up yellow liquid? Stomach that are empty – Acids or bile could simply indicate that your pet’s tummy lacked contents. Tummies that are struggling to process contents – If your pet ate something that disagrees with them, throwing up multiple times may produce yellow liquids. Some disease-related issue – Underlying health issues may also contribute to this, often as a result of cancers, heartworm, or liver disease. As this is a normal process, you shouldn’t be too concerned if this happens. If the vomiting continues past 24-hours or other symptoms like fever, labored breathing, or diarrhea occurs, speak to your vet. 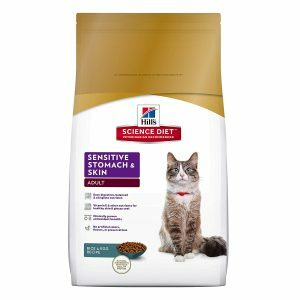 Of the seven products reviewed above, Hill’s Science Diet is the best cat food for sensitive stomach. Recommended by North American vets since the 1980s, Hill’s Science offers pets that aren’t suffering from lactose intolerance an easy to digest food. It provides a balanced nutritional intake that breaks down quickly. This formula also aids your pet’s coat as well as their skin. 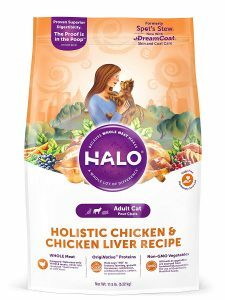 Halo Holistic Natural – Recommended for those needing a non-GMO sourced feed. 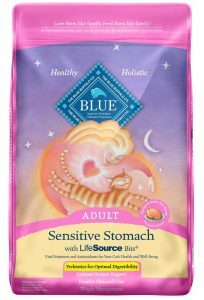 Blue Buffalo Sensitive Stomach Natural – Selectable for owners wanting supportive digestion. 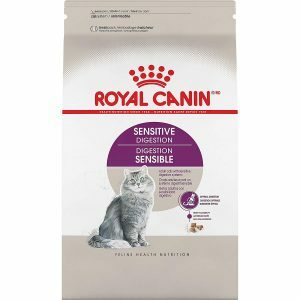 Royal Canin Feline Health Nutrition Special – An alternative for pets needing quick food breakdown. 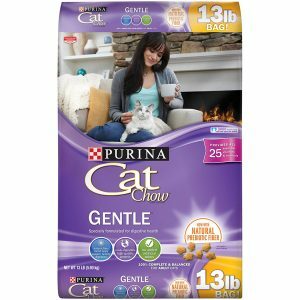 Purina Cat Chow – Recommendable only if other products aren’t available. 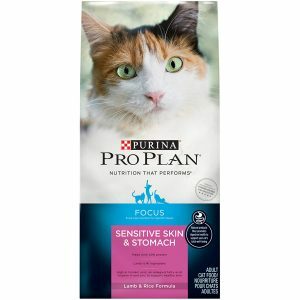 Purina Pro Plan FOCUS – Would suggest if feline companion vomits a lot. 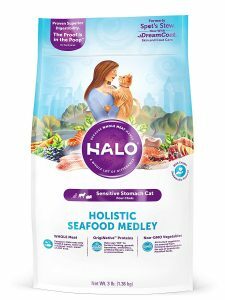 Halo Holistic Natural Dry Cat Food – Suggestible for owners looking for natural food sources.